Let’s talk about the importance of content hubs. All you marketers who rely solely on Facebook to publish your content - we’re talking to you! We hear you: what is a content hub? Simply put, it’s a place for you to store all of your digital content. Like a blog on your website. Or a completely separate content hub with its own content strategy to build and nurture audiences of warm leads that you can sell to. The below example is from Woocommerce. They opted for a blog on their corporate site, for helpful tips on using the platform, case studies, and company information. 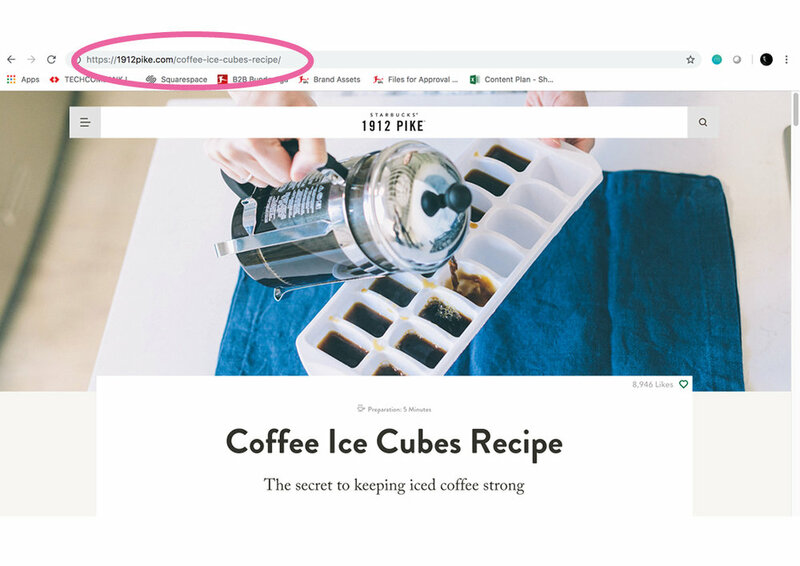 Starbucks, however, offer a different content experience on a separate URL - 1912 PIKE, which is a coffee education blog named after the address of their first branch. Check this blog page from Dreamhost for a list of 2018’s best company content hubs. Why should your brand should invest in a content hub instead of relying on Facebook as a place to store your stories? Only producing content on Facebook means you’re talking to very few people organically - you hardly get seen by your audience unless you pay. And even when you do pay, your hard work quickly falls from people’s timelines into the abyss once your “boost” finishes. What next? You create more content and spend more on distribution, repeat. A good way to avoid feeding the black hole with your content and cash? Create a strategy that means your social posts can be ‘i-framed’ back onto a content hub as part of larger blog articles that can get found elsewhere on the internet. You can also share these articles, which include your bite-sized Facebook posts, back on to Facebook as a web link/URL. This approach means that content hub users who come direct or from search engines can easily find and engage with your Facebook content, and Facebook users get directed back to your content hub. It gives your content more shelf life. Try looking for an old piece of content on your favourite brand’s Facebook page. Content gets buried and hard to find? At least with your content hub you can gather all your efforts in a place that is clearly categorised, indexed by search engines (see point 3) and easy to navigate through - quick for your followers and staff to find your content and share to social media or email marketing campaigns. If you produce content in a content hub, you’re going to get indexed by search engines such as Google - especially if you create content using Google Trends to see what the latest search trends are, and use basic SEO techniques. Google emphasises the importance of regular, fresh content on your site that ‘links out’ to other websites - i.e, content that is so good that other websites share it and link to your website as a reference. This creates doors to other sites that the Google Spider can crawl through, and if the linking websites are both legitimate and related to each other, Google showers you both in “link juice” - which essentially moves you up the search rankings. Content hubs are what set the best brands apart from the newbies and reinforce your brand presence. They give you a chance to show off your core brand values as well as your sales messages. What brand managers in Vietnam often don’t realise is that a brand is so much more than a quickly drawn logo. A logo is the tip of the iceberg, and a content hub is a great place for you to build a strong brand and communicate it to the people who matter: existing or potential customers. Very few brands are using content hubs in Vietnam, and this comes back to point 4: look much better than your competitor who only uses Facebook to do the same old stuff. The following client, a real estate township in northern Vietnam, hired We Create Content to produce a whole host of content around “better living” for Vietnamese families, with the content verticals: Home, Health, Education and Art. It won consistent search traffic and helped the real estate company engage audiences in a much different way from its competitors in Vietnam’s real estate market. A “better living” content hub for Ecopark in Vietnam: www.song.ecopark.com.vn. See the video case study here. Once you’ve built your content hub, use it as the base for publishing; a place to create stories, distribute them, create distribution campaigns, generate leads and nurture them - most likely through inbound marketing platforms such as Hubspot. Without doubt, content hubs help give your content marketing more shelf life. They get you found in search engines, help you standout from your competitors, and can be used as a jumping off point for a full publishing and marketing ecosystem. They take planning, creativity, budget and vision, but will help reduce your brand’s reliance on Facebook. Thank you - we’ll be in touch to arrange it!